It’s Ballinasloe Horse Fair time again. I love the annual Ballinasloe Horse Fair and not because I love horses. In fact the only time I like horses is when they’re in between two burger buns with onions, cheese and ketchup! No, it’s the people, the smell, the shite and all the other goings on that attracts me year after year. It’s a photographers paradise if you like street photography. If you’re into landscapes, milky water shots and swans, then Ballinasloe is not for you……. Hopefully this will give you a flavour of this wonderful fair, the oldest horse fair in the world. I’ve a few more shots over here if you want to have a look. The post Ballinasloe Horse Fair 2014 appeared first on All Seeing Me. 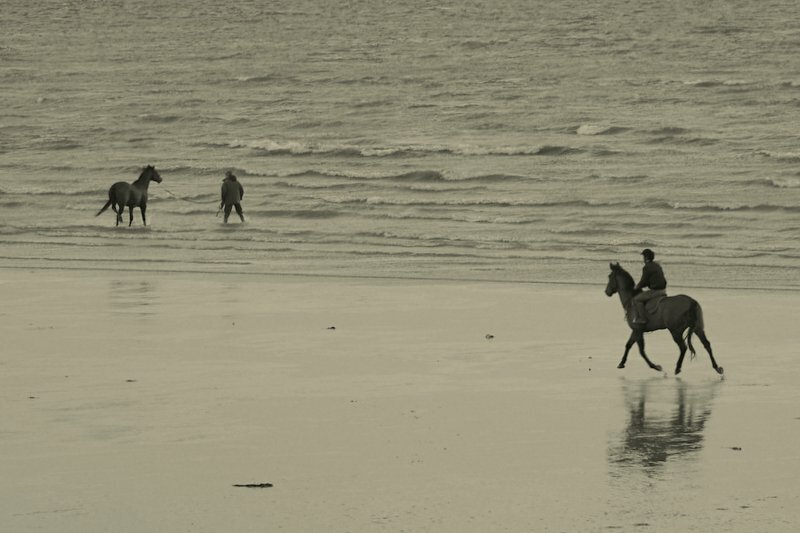 The post Horses on Galway Beach appeared first on Patrick Dinneen Photography. The post The Galway Races- BallyBrit racecourse (Running On Empty) appeared first on Patrick Dinneen Photography. So we got to visit the Garda mounted Unit stables in Áras an Uachtarain with the camera club. What a fantastic place set in the grounds of Mickey D’s house in the park. It’s a small yard with about a dozen HUGE horses. I’m sure you’ve seen them at various events over the years – they are feicin massive! Binding up the horses tail is one of the preparatory tasks undertaken before transporting the horses anywhere. It protects the bone in their tail from any banging while they are in the horse box. Kinda made a bit of a horses arse of this shot but there you go! You can’t visit a stable without posting one of those tacky shots, so here it is…..